Plot Summary: Yoshijirō Saku has just transferred to Kōka Academy, which is famous for its theatrical activities. On his first day at school, he started a fight with Mirai Aoi. To make the matter worse, the fight was seen by Yukihito Aizen, the head of the Drama Club. All of Yoshijirō's classmates are problem students, and he thought he could use the fight to rid himself of them. 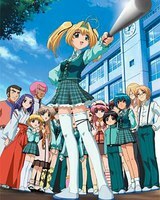 Then, Yoshijirō is assigned to direct his class in a drama competition against the Drama Club. If they lose the competition, they will be suspended. However, because they are problem students, he has difficulties directing them. Recording Studio: Swirl Recordings & Film Inc.